The Mahabharata (Markandeya Samasyaparva) describes a story of a baby born from the brilliance of Siva, of which Indra is afraid. The baby named Guha/Skanda, raises a loud cry which makes all the Devas trembled with terrible fear. Indra throws his thunder-bolt on Skanda, which results in the birth of a goat-faced youth from the right side of Skanda and he is known as Vishaka. However, it may be noted that Guha and Vishaka are merged in Skanda. Vishaka nakshatra is considered very auspicious, as most of the saints, geniuses and others have born in that nakshatra, e.g., Buddha. Born in the same nakshatra, Muruga is known as “Gnyana Pandita” = Authority on Wisdom. 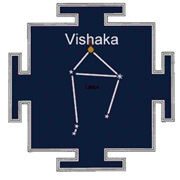 Karthikeya and Vishaka incidentally represent 3rd and 16th Lunar mansions of the Zodiac. In fact, Vishaka is a binary star as per Sanskrit literature. Therefore, the ancient’s knowledge of the binary stars without telescope or any other technological aid is very intriguing and interesting.Vaikasi Vishakam celebrates the anniversary of Lord Karthikeya’s creation. It was in this month (May-June) that Lord Muruga was born with Vishakam as His birth star. On this day, elaborate abhishekams are done in all His temples. It is a time of gift giving to pandits and great souls, weddings, feedings for the poor, caring for trees, spiritual initiation, diksha, and conclaves of holy men. His mantra, “Saravanabava” – a combination of 6 syllables – constitutes the highest mantric power. Sage Agastya, who mastered this mantra and as a result had direct encounters with the 6-Headed God Muruga, revealed the secrets of the 6 syllables. Each of the 6 syllables is dedicated to the 6 faces of Lord Muruga.